I published this recipe back in 2015 the year I started this blog and perhaps the name didn’t sound so attracting but it didn’t seem to be a noticeable recipe. 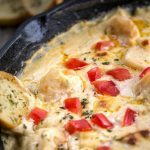 This recipe deserves a re-post, it’s actually an AMAZING dip! This is NOT a stringy or overly cheddar tasting dip quite the contrary actually. It’s a creamy yet not too thick kind of dip and the cheddar cheese melts nicely without any strong stringy affect. Considering the white cheddar cheese ingredient, it actually makes a really good fit for this particular dip. Even if you have only a handfuls of shrimp, TRY this recipe! It makes one pretty and GOOD tasting appetizer! 1. Preheat oven to 425° F. Arrange baguette slices over a large baking sheet. Brush with butter and sprinkle with seasoning. Bake 8-10 minutes. 2. Using an oven safe pan, combine the cream cheese, heavy cream, mayo, 1 tbsp olive oil and garlic powder. Melt over medium heat. Stir in the parmesan cheese, cheddar cheese, thyme, parsley, garlic, shrimp and diced tomatoes. Transfer into the oven and bake for 15 minutes until bubbly and brown spotting appears on the top. 3. Serve with crisp baguette slices–DELICIOUS! I tried a DELICIOUS shrimp dip at Uno's before and although I don't recall a distinctive crab taste, I tried replicating what's currently called the Uno's Shrimp & Crab dip (minus the crab.) This can ALL be done in ONE-PAN! Perhaps they just add a tad of crab meat but it's so tasty without it, my daughter even said, "everyone needs to try this." Preheat oven to 425° F. Arrange baguette slices over a large baking sheet. Brush with butter and sprinkle with seasoning. Bake 8-10 minutes. 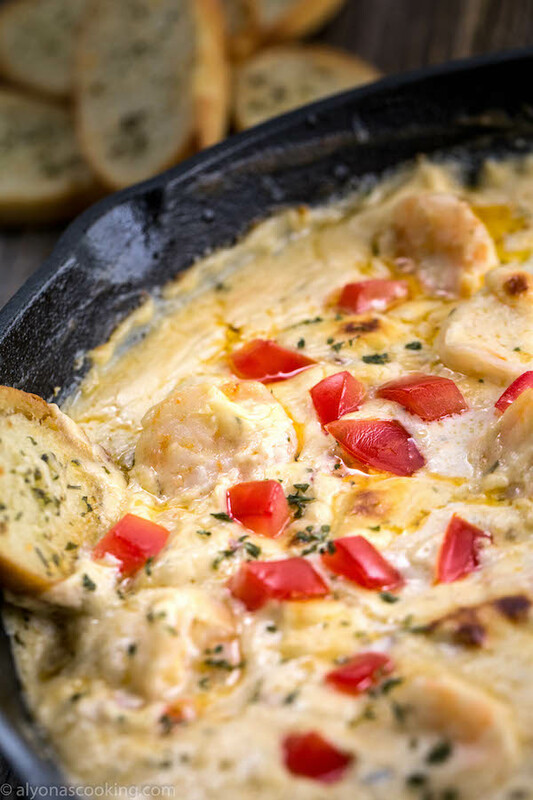 Using an oven safe pan, combine the cream cheese, heavy cream, mayo, 1 tbsp olive oil and garlic powder. Melt over medium heat. Stir in the parmesan cheese, cheddar cheese, thyme, parsley, garlic, shrimp and diced tomatoes. Transfer into the oven and bake for 15 minutes until bubbly and brown spotting appears on the top. Serve with crisp baguette slices--DELICIOUS!